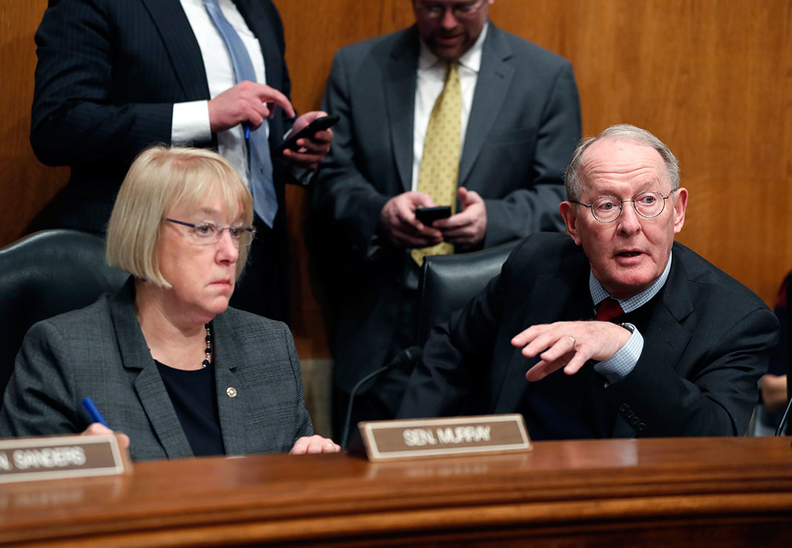 Senate Health, Education, Labor, and Pensions Committee Chairman Sen. Lamar Alexander, R-Tenn., accompanied by the committee's ranking member Sen. Patty Murray, D-Wash. The senior Republican and Democrat on the Senate health committee courteously clashed Tuesday over how much freedom Congress should give states to modify the Affordable Care Act's benefit rules in order to make individual coverage more affordable. Most of the senators and expert witnesses speaking in the third of four planned hearings agreed Congress should swiftly fund payments to insurers for the ACA's cost-sharing reductions for lower-income enrollees, though it wasn't clear that Republicans supported insurers' calls for long-term funding. Disagreement over how much flexibility to give states to redesign the ACA's coverage requirements under state innovation waivers could doom prospects for passage of a stabilization package before the Sept. 27 deadline for insurers to decide whether to offer individual-market plans in 2018 and what their premiums will be. Without certainty about CSR payments, insurers are expected to raise rates in some areas by more than 20%, or stop offering coverage on the exchanges entirely. "I could caution members that there still are significant differences to deal with," said Sen. Lamar Alexander (R-Tenn.), chairman of the Health, Education, Labor and Pensions Committee. "A true compromise requires Democrats to accept something Republicans want—more flexibility for states—and Republicans to accept something Democrats want—continued funding for cost-sharing payments." In reply, Sen. Patty Murray (D-Wash.), the committee's senior Democrat, said in her opening statement that the governors and other experts who testified up to that point had not indicated state flexibility was needed to stabilize the market in the short term. "This may be a difficult needle to thread," she said. Meanwhile, competing healthcare bills could potentially erode bipartisan support for a market stabilization package. Republican Sens. Bill Cassidy of Louisiana and Dean Heller of Nevada said at the hearing that they are pushing ahead with a new bill to repeal and replace the Affordable Care Act, details of which they plan to release Wednesday. "It would be deeply disappointing if another partisan debate over Trumpcare erupted and derailed our efforts at this stage," Murray said. And from the left, Sen. Bernie Sanders (I-Vt.), is set to unveil a new version of his single-payer plan Wednesday. A growing number of congressional Democrats are lining up behind his plan. The continuing partisan distractions dismay insurers and providers, who urge rapid passage of a narrow bill to bring down premiums and keep insurers and consumers in the individual market for 2018. They want Congress to focus on funding the cost-sharing reduction payments, establishing a reinsurance program, supporting enrollment outreach activities—which the Trump administration has curtailed—and making sure the ACA's requirement that everyone buys insurance is fully enforced. Insurers also would like to see repeal of the ACA's health insurance tax. "Funding the cost-sharing reduction payments on a permanent, or at least multi-year basis, is probably the single most important thing Congress can do to quickly stabilize the individual market," Kaiser Permanente CEO Bernard Tyson told the committee Tuesday. "If we are going to provide meaningful relief to consumers for 2018, we need to do it very quickly, within days rather than weeks. The potential conflict between Republicans and Democrats on the HELP Committee is over Section 1332 of the ACA, which lets HHS grant waivers to let states establish their own, customized coverage systems. That section of the law, as interpreted by the Obama administration, requires states to maintain the same level of coverage and affordability as provided under the ACA's framework, with four so-called guardrails to ensure that. Alexander said the current guardrails essentially bar states from allowing anything other than current ACA marketplace plans, with 10 minimum essential benefit categories. "This would be like a restaurant menu with only one item, or a travel agency with only one destination," he said in his opening statement. Murray fretted, however, that state flexibility proposals could boost out-of-pocket costs for patients and their families. "Democrats will reject any effort to use this discussion as a way to erode the guardrails and protections that so many patients and families rely on," she said. Alexander outlined a number of process changes witnesses had recommended to make it easier for states to get federal approval for 1332 waivers, including shortening the CMS review period. Committee Democrats seemed open to speeding approval of waiver requests. There also was discussion of letting states request waivers combining changes in their individual insurance and Medicaid markets, though former CMS acting Administrator Andy Slavitt cautioned against using Medicaid funding for non-Medicaid insurance consumers. Former HHS Secretary Mike Leavitt testified that HHS could give states a menu of standard waiver plans for which they could receive automatic approval. But Alexander argued for giving states authority to relax ACA benefit requirements and let insurers sell cheaper, stripped-down plans. "This type of approach to insurance allows individuals the opportunity to have a more personalized health insurance plan," he said. The idea of letting insurers offer plans lacking benefits like behavioral health or maternity coverage drew sharp skepticism from committee Democrats and some experts who testified. "I don't want to see flexibility given to states where less people have coverage or the quality of coverage is affected," said Sen. Benjamin Cardin (D-Md.). "When you buy an insurance product, you shouldn't have to worry about coverage for behavioral health if your child needs that," Slavitt said. "And we shouldn't go back to not requiring maternity coverage." Aviva Aron-Dine, a senior fellow at the liberal Center on Budget and Policy Priorities, explained that if benefits that attract higher-cost enrollees are not required, insurers will stop offering them. "A la carte doesn't work," she said. Even Cassidy, who wants to convert the ACA into a program of block grants giving states tremendous flexibility in designing coverage, questioned how much paring back essential benefits would save on premiums. "I have to pick my political battles," he said. "Mandated benefits may increase cost relatively speaking. But it's not the huge cost driver."